You can stream the audio from the official home page of the program here. Suigintou: [Echoing voice:] Suigintou's "Koyoi mo Ennu~i". [Sigh.] How do you do. I am the proud first doll of the Rozen Maidens, Suigintou. Well, shall we begin Suigintou's "Koyoi mo Ennu~i"? [Chuckle.] Really, I haven't the free time to be dealing with you foolish humans, but, well, this is a program where I'll join you as I see fit, when the fancy strikes me. Honestly, there are so many freaks out there, it's so bothersome. [Breath.] Now that I think of it, when was the last time? Hmm... I wonder what episode this is...? [Chuckle.] Well, no matter. How did you enjoy "Ouverture"? It must have been fresh to you all. [Giggle.] As for myself, it made me remember my past for the first time in a while. Hmph, honestly... 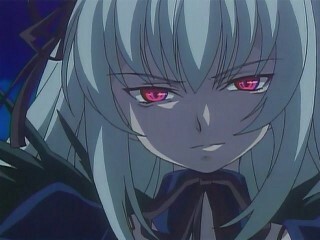 I got pissed at Shinku all over again! Be that as it may, did you see my sword-handling technique~? You could fall in love with that, if I do say so myself~! [Giggle.] Well, that kind of thing doesn't matter... So, then, listen to "Koyoi mo Ennu~i" all the way to the end. Woman: Have you been feeling irritable lately? Lactic Acid Bacteria Beverage has the calcium that will calm your frayed nerves, and it also includes lactic acid bacteria to keep you at the peak of health. Drink Lactic Acid Bacteria Beverage, and let's all live healthily each and every day! Girl: [Singing:] There~ there~, Lactic Acid Bacteria Beverage~! Hey! ... where I entertain the worries and problems of the listeners. This is a Corner where I'll help you to resolve them, but~, for one such as myself, proud to be the most suitable of the Rozen Maidens to become Alice, why must I have to listen to the stupid worries of vulgar humans~? In the first place, I have no interest in your stupid worries, and I don't have the free time to deal with them all one by one~. Well... [Laugh.] There's no helping it, so I suppose I could listen to some of them. So then, I don't really feel in the mood for this, but I'll present some of the worries that you sent in. I received this one from Medium-name Anon-san. Thank you. ... "I have no problem getting to sleep, but lately no matter what I do I can't wake up in the morning. As much as I tell myself I have to get up, I end up drifting off again two or three times and oversleeping. What should I do?" ... Yes, there are people such as these, aren't there~. Sloths. [Echoing voice:] Why don't you try becoming JUNK?! Next. This one comes to me from Medium-name Minomoto-san. Thank you. ... "I wish I could drink some of the tea that Gin-sama made in 'Ouverture'. What should I do that will allow me to drink some?" ... [Echoing voice:] I have no tea to serve to the likes of you! Next. I received this one from Medium-name Rokechi Yokohama-san. Thank you. ... "Gin-sama, hello. Please listen to my problem. I'm tone-deaf, and I'm hopelessly embarassed to sing in front of other people. It's a pain when I go out with my friends to karaoke. What should I do in order to sing better?" ... [Sigh.] What is the point of singing songs? Ahh, there's also a hospital patient I know of, who often sings even though she's no good at it. Honestly, she's such a bothersome earsore... Well, with songs, just put your feelings into them and they'll be listenable in their own way. Yes... Try singing for the sole sake of me, Suigintou~. [Echoing voice:] If you do that, then I might not be unwilling to listen to it. Next. This one is from Medium-name Asagiri-san. Thank you. ... "Lately there have been two or three times when I try to put on a plain tee shirt, and I end up getting it on backwards or reversed. What should I do?" ... Yes, lately there are so many shirts without tags on them, so the- ... What the?! [Echoing voice:] Don't confide every such trifling little thing as that to me! Would you like to become JUNK?! Suigintou: Well, that was about what I expected~. Honestly, to worry about such pointless things, you are really such fools~! [Laugh.] Honestly, I can't deal with you all~. [Laugh.] Aren't there any more serious problems than this? Listen to the ending for the address. Have you been feeling irritable lately? Lactic Acid Bacteria Beverage has the calcium that will calm your frayed nerves, and it also includes lactic acid bacteria to keep you at the peak of health. Drink Lactic Acid Bacteria Beverage, and let's all live healthily each and every day! Suigintou: [Laughter.] [Echoing voice:] Are you getting your lactic acid bacteria~? This Corner is one in which I entertain your so-called words of wooing. If you believe that you'd like to become my Medium, then I'll have you send in your words to try and sway my heart. It seems as if there are so many people who would like to become my Medium, I'm troubled~! Although, to win the Alice Game, I'm sufficient on my own without having to need some stupid Medium~. But, well... if there is any human capable of being worthy of me, then I might consider it~. Although I'll warn you up front - if there are any lame jokes... you know what will happen, right? My heart won't be swayed by any superficial words, no matter how many of them you may write~. Well then, let's read a few, shall we? Suigintou: This one comes to me from Medium-name M. C. Banzai-san. Thank you. Suigintou: ... Huh? What's this? "Hip-hop style"...? [Rapping:] "Yo yo yo, that hot girl is Suigintou. She's an unexpected glutton. Today again she ate the last kurikinton. Okay, baby, check it out..."
Are you mocking me?! Would you like to become JUNK?! That was horribly lame!! This one was received from Medium-name "Cram School is Nice"-san. Thank you. "When I grow up, I'm going to become Prime Minister, and then I'll declare every Wednesday 'Suigintou Day'." Having just Wednesday seems kind of like half-measures, doesn't it~. If you must, then make every day "Suigintou Day"~. Suigintou: ... But, anyway... [Chuckle.] Just how old are you? Next. This one is from Medium-name "Eh?! No way! Seriously?!"-san. Thank you. ... "Gin-sama, good evening. In order to become your Medium, I have to share a common purpose with you, right? So..."
"... Let us defeat Shinku together!" ... [Laugh.] You don't get it, do you~. Naturally, I'm enough to handle the likes of Shinku by myself. I don't need your help. Next. I received this one from Medium-name "Lonely Christmas"-san. Thank you. Suigintou: "Come to me, Suigintou. I will wrap you tenderly in my arms." That's disgusting! Don't get so full of yourself! I'll send Meimei to pay you a visit!! [Chuckle.] Well, from the start I didn't have any high expectations from the likes of you all~. After all, naturally, I'm sufficient on my own to defeat Shinku and the others. But, if you must insist that you want to become my Medium, keep sending in your letters~. Try as best you can~! It's about time for Suigintou's "Koyoi mo Ennu~i" to end. [Sigh.] You all are still so naiive. [Chuckle.] Honestly, it was a waste of time~. The next episode will broadcast whenever I feel like it. When that happens, I have no choice but to present you all with some information that I wasn't able to read this time~. Keep checking the program's home page and Mellow Head's home page faithfully as often as you can. Well then, see you later~! Goodbye~!